The Battle on Lexington Green Reenactment will take place on Monday, April 15, 2019 at 5:30 am on the Lexington Battle Green in Lexington, Massachusetts. This event recreates the historic skirmish in Lexington on the first day of the American Revolution. Following the ringing of the bell in the Old Belfry, members of the Lexington Training Band (now known as the Minutemen) gather on Lexington Green to await the column of British Regulars as they march into the town center. A shot rings out, the skirmish follows, and the British column marches on towards Concord leaving dead and wounded behind. To commemorate the anniversary of the first day of the American War for Independence, the Lexington Minute Men, and local British Revolutionary War reenactors, depict the skirmish that took place on Lexington Green, early on the morning of April 19, 1775. Witness the tensions mount, as the local militia company from Lexington confronts the King’s Regulars, and the ensuing skirmish that follows. The ‘Shot heard ’round the world.’ The Battle on Lexington Green Reenactment is on the officially observed Patriot’s Day, the third Monday of April, starting at 5:45 am on the Lexington Green. Arrive early for the best viewing spot. The Battle on Lexington Green Reenactment offers a great opportunity to witness our common heritage as Americans. Spectators begin to arrive at Lexington Green as early as 3:00 in the morning in order to get a prime spot for the events that begin with the alarm bell sounding in the Old Belfry at 5:30 am. There are usually 8,000 – 10,000 spectators lining the Green to watch the 77 Lexington Minute Men and their families portray the colonists, and more than 150 British portray His Majesty’s Regulars (“red coats”) of 1775. The battle, as relived through the Battle on Lexington Green Reenactment, begins with a quick skirmish at Lexington Green, and expands into a day­long series of fights, which in 1775 stretched along a country road involving over 3,500 provincial militia men, and over 2,100 of His Majesty’s Regulars. This was the beginning of the American Revolution. The initial fighting in the war was a local action between Britain and her recalcitrant colony of Massachusetts. This skirmish led to fighting throughout the original 13 colonies and Canada, and international war, culminating in American Independence. “The ‘Shot that was heard around the world’ and American Independence started on Lexington Green. The Battle on Lexington Green Reenactment is just one event in which the Lexington Minute Men will participate on Patriot’s Day. The Battle at Lexington starts at 5:45 am. The Minute Men also participate in the Lexington Sunrise Youth Parade at 7:30 am, additional ceremonies near the Green at 8:15 am and 10:15 am and the Lexington Patriots Day Parade at 2:00 pm. The Lexington Minute Men is a civic reenactment organization dedicated to honoring all the brave Patriots who have made the ultimate sacrifice in defense of our Nation’s freedom. The Minute Men have a long proud history, from the militia that fought on the Green in 1775, to providing men to fight throughout the American Revolution. The Minute Men gained attention again during the Centennial Celebration of 1876, when President U.S. Grant saluted the 77 men who stood on the Green. In the past 125 years, the Minute Men have been involved in a number of ceremonial, educational, and civic functions. During the Bicentennial, the Minute Men served as honor guards for President Ford and Queen Elizabeth. The Lexington Minute Men are under the command of Captain Steve Conners. Attendance at one mandatory drill is required to participate in the re-enactment and two required to be issued powder. Muskets must pass all safety inspections performed by the 2nd Lieuteant of Muskets, or other designated safety officer. The “FIVE FOOT RULE” will be enforced for all men, women and children. Refer to “Clothing Guidelines for the LMM” by Alex Cain. All child participants must be those of members only. When a members’ child (children) is (are) not participating, grandchildren may be substituted. All children must be accompanied by a member’s spouse, or an approved guardian. Any exceptions to the above must be approved by the LRC before taking the field. Character changes after dress rehearsal are not permitted. The LRC reserves the right to re-assign characters for reasons due to low or non-participation in Company activities, lack of paid dues or lack of effort in researching their assigned role. All members, women, and children are required to attend the dress rehearsal. 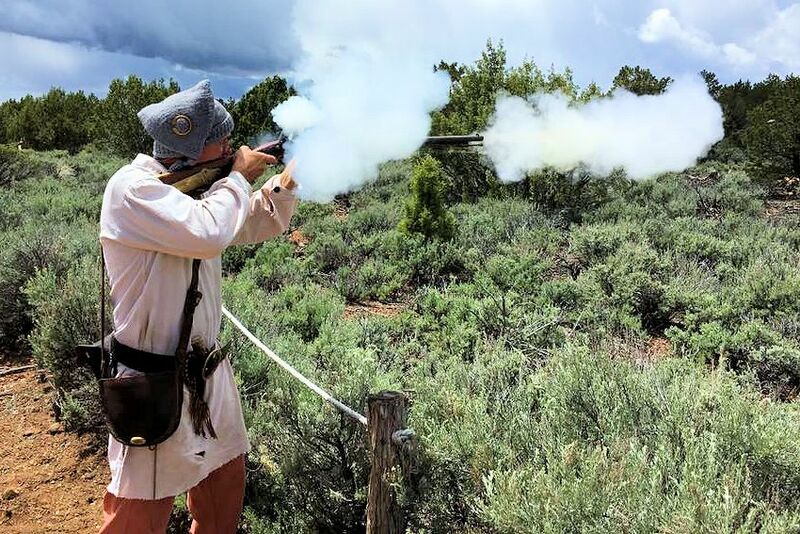 Reenactors must stay “in character” prior to, during and after the event. The LRC will assign all security functions as needed. Ramrods, although allowed must never be removed from muskets for any reason. Recently issued “Bounty Coats” are not accurate for this time period and are not permitted. The rain date for the Battle on Lexington Green Reenactment is the Saturday following the official Patirot’s Day observance. Each year in mid-April, thousands of people flock to historic Lexington and Concord and Minute Man National Historical Park to celebrate Patriots’ Day. Patriots’ Day is a special Massachusetts State holiday commemorating the opening battle of the American Revolutionary War, April 19, 1775. The holiday (Officially observed on the third Monday of April), and the week beginning two Saturdays prior, is celebrated with parades, reenactments and commemorative ceremonies. Mark your calendar today so you don’t miss the next Battle on Lexington Green Reenactment on the third Monday of April at 5:30 am on the Lexington Battle Green in Lexington, MA.